If you still haven’t read how and what exactly led to the demise of the MintPal crypto currency exchange, one of the big ones for altcoin trading until a few months ago, then you might want to check out the website called MintPal Justice. The website is the official effort of the former partners of Alex Green aka Ryan Kennedy that have purchased the crypto currency exchange earlier this year to bring him to justice. On that website Michael and Ferdous tell the whole story from their point of view and how they became partners with Ryan Kennedy, or “Alex Green” – the CEO of MooPay Ltd for the acquisition of MintPal from its previous owners. It seems that Ryan Kennedy not only cheated and lied to the users of the MintPal exchange, but also his partners and employees in the end getting away with thousands of Bitcoins that are not his own. The website MintPal Justice also takes donations with the goal to cover the legal fees of the effort to bring Ryan Kennedy to justice. So far the effort has generated over 22 BTC in donations out of the goal of 75 total required (roughly $25000 USD). Moopay LTD, the company behind Moolah and the MintPal exchange, has officially announced that it will be filing for bankruptcy and dissolution following the administration process; and ceasing operations. The company ensures that all funds held in consumer accounts are safe – consumer funds are essentially held in the equivalent of a client trust account and are fully separate. People should be able to withdraw them via the normal route up until the end of the month. Any businesses or entities with funds held in any other fashion with the company will be contacted over the next month as a part of the bankruptcy and creditor process. As a result of the company closing doors and filing for bankruptcy, MintPal is currently down and will no longer be managed by Moolah who are apparently do not own the exchange, but were only responsible for management. There will be a new management team who will be responsible for making a number of stability changes, UI improvements and bug fixes as well as handling the resolution of issues surrounding missing balances. 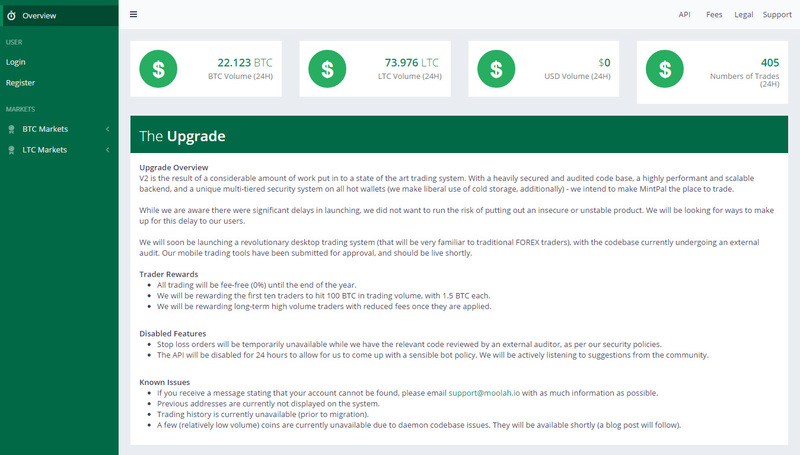 An update with more information should follow on mintpal.com shortly, with details of further timeframes according to the announcement made. It is a fact however that MintPal needs to earn back the trust of the thousands of users it had and that is getting harder to achieve as each ay passes with things not getting much better than they were the day before.